Registration is open now for everyone who wants to help with the sixth annual Big Clinch River Cleanup on Saturday, July 21. It starts at 8 a.m. with breakfast at the scenic Museum of Appalachia, 2819 Andersonville Highway, Norris. The cleanup will wrap up about 2 p.m.
Everyone who enjoys the river, from anglers to kayakers to wildlife watchers, is invited to help remove litter from the Clinch and its banks. The community wide cleanup is an expansion of annual pickups run for many years by members of the Clinch River Chapter, Trout Unlimited, which hosts the event. 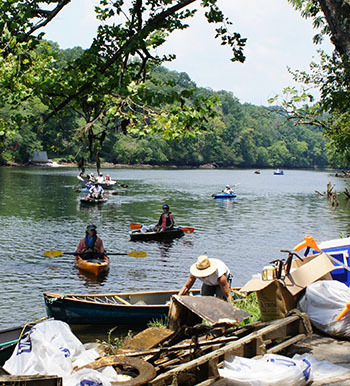 Last year, 103 volunteers gathered 75 tires and nearly 2,200 pounds of trash from the river. • Above the water line, workers walk along riverside roads and through parking areas, gathering trash. • Volunteers wearing waders patrol for litter in shallow water. • In kayaks and canoes, volunteers work to clean shorelines and shallow water where there is no public access by road. • In powerboats and driftboats, volunteers haul tires and other items from the depths. Support for all the teams is supplied by volunteering emergency medical people, ham radio operators, tire disposal professionals and workers with trucks who collect and dispose of filled trash bags. The first 100 volunteers to register will qualify for a free full breakfast at the picturesque museum (expenses of the meal are supported by a grant from the Tennessee Valley Authority). To sign up, please visit crctu.org and click on Big Cleanup Registration. For more information, contact Rusty Hallett at hallettrusty@gmail.com or call 859-227-1227, or Dave Easter at dleaster660@gmail.com or 859-608-7090. The event will be held rain or shine (in case of severe weather, the breakfast will be held but volunteers will stay on shore). Clinch River Chapter TU works to preserve and protect the Clinch River tailwater and its watershed through conservation projects and through education of children and adults in aquatic natural resources. Meetings are held the second Thursday of the month in the parish hall at St. Francis Episcopal Church, Norris, except when outdoor activities are scheduled.